1. Finish Patrick's line: "I always believed it was _____ that makes you who you are." 2. Amanda was believed to have been carrying her favorite doll at the time she went missing. What's the name of the doll? (Hint: The name we are told at the onset, not the name revealed at the end). 3. How old is Amanda? 4. Patrick and Angie don't typically handle missing persons cases. This is probably why Angie asks why Beatrice doesn't try hiring _____ instead. 5. Lionel says Helene was watching _____, her favorite TV show, at the time Amanda went missing. 6. It's Wife Swap. Even worse, at the time Patrick and Angie first meet Helene, she's on the couch watching _____. 7. To confirm with Beatrice that she and Patrick will take on the case, Angie says: "We can't do any harm, right?" What changed her mind? 8. According to Lionel, Helene drinks heavily and probably does this drug a couple times a week. 9. Who said it? "I remember you from high school. I see you're still a little conceited, huh?" 10. Through friends, Patrick finds out that Helene wasn't watching TV at the time Amanda went missing. Where was she? 11. Helene worked as a mule -- aka smuggled drugs -- for a man who goes by this name. 12. The investigation team pays a visit with Ray. When they arrive, they find him dead. How did he die? 13. Helene believes the stolen drug money is in a safe place. Where did she hide it? 14. Which character actually says "Gone Baby Gone"? 15. Who said it? "I mean, you might think that you're more from here than me, for example. But I've been living here longer than you been alive. So who's right?" 16. A trade is arranged near a lake. The team gives Cheese the money, and Cheese gives the team Amanda. Things take a turn for the worst when Cheese is shot and Amanda presumably ends up in the lake below. Who jumps in after her? 17. A seven-year-old boy is abducted, and a search leads Patrick into a building housing a known child molester. What does the child molester say right before Patrick discovers the dead boy? 18. Where is the boy's body discovered? 19. Remy admits to Patrick that he once planted evidence on a guy. What did it for him was seeing the guy's child, who wanted to tell Remy that he knew his multiplication tables and was clutching his _____ for dear life. 20. In a startling revelation, who knew Cheese got robbed before Cheese did? 21. Remy testified for Lionel in a prior case. What did the case pertain to? 22. Angie: "This is horrible." _____: "Not for Channel 9." 23. Lionel: "Twenty-three years is something, right?" Lionel says this after ordering _____. 24. After Lionel exposes his real story to Patrick and Angie, Remy barges into the bar toting a rifle and wearing a mask. What color is the mask? 25. 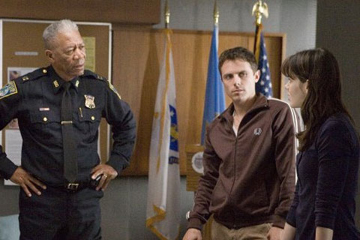 Gone Baby Gone made in U.S. returns about what it cost to make. How much did it earn Stateside?